HARTFORD — Gov. Ned Lamont’s two key education bills — including one intended to push school districts toward regionalization — were approved by a legislative committee Friday, but with a few notable changes. Members of the Education Committee eliminated the governor’s proposal to have municipalities chip in on teacher pensions and scrapped a plan to require homeschoolers to register in their school districts. The votes, which went largely along party lines, were on House Bill 7150 — an act implementing the governor’s budget — and Senate Bill 874, the controversial bill that includes what some view as punitive steps to push school districts toward regionalization. The latter bill also would have established a commission charged with creating a plan for redistricting. Last week, the Lamont administration changed language in Bill No. 874 making it more palatable to many by removing every reference to “redistricting” and “consolidation” and by empowering the commission to make only recommendations. Senate Bill 874 was one of three bills that prompted hundreds of opponents to turn out for a hearing last month out of fear their school district would be forced to merge with others and that local control would be lost. Earlier this month, two of the bills died, and last week Lamont recast his proposal to emphasize that his effort to get school districts to share services and save resources would be voluntary. “He [the governor] heard the people loud and clear and he heard committee members loud and clear,” said Rep. Bobby Sanchez, D-New Britain, and co-chairman of the education committee. The bill approved by the committee maintains the governor’s language, but also eliminates a provision that was considered punitive by many. That controversial section of Lamont’s bill required small districts– defined as districts with fewer than 10,000 residents, fewer than 2,000 students, or with fewer than three schools — to share a superintendent with another district or name a chief executive officer to oversee the schools. Education Committee Ranking Member Kathleen McCarty voiced concerns about the governor’s education bills and voted against them. Ranking Member Sen. Eric Berthel is to her right. The bill said that if such a district chose instead to maintain its own superintendent without sharing, the commissioner of education could withhold funding in an amount equal to the superintendent’s salary. However, Republicans said the steps taken by the administration to water down the bill did not alleviate their concerns. Rep. Gail Lavielle, R-Wilton, said that despite the language changes, “which do show there was listening and acknowledgement,” she is concerned about the “original discourse and the original intent” of the bill with its references to re-districting and regionalization. In addition, Lavielle said there is nearly $1 million in the governor’s budget to create and run the commission. “I don’t see a reason to spend that money, especially in our severe budget straits, because I don’t see a reason for the bill,” she said. 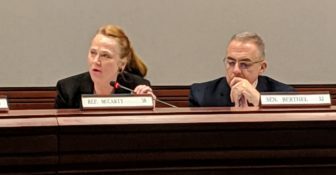 Rep. Kathleen McCarty, R-Waterford, a ranking member on the committee, said she opposed the bill because it leaves the structure for a commission to move forward. “At some point this could turn to more forced regionalization,” she said. Sanchez noted that the bill also is stripped of the provision that would require home-schoolers to register with their district. “So you don’t have to send me thousands and thousands of emails,” Sanchez said to the knowing chuckles of a dozen or so home-school advocates in the attendance. Twenty two Democrats voted in favor of Senate Bill 874, while 13 Republicans voted against it. Two legislators were absent. After it was approved, about a dozen opponents, who were at the meeting were disappointed. Republicans and Democrats alike spoke in favor of the committee’s decision to eliminate Lamont’s plan to have municipalities pay for 25 percent of teacher pension costs, and a greater share if teachers were paid above the statewide median. She said the plan would have shifted $73 million “onto the backs of already burdened property taxpayers…COST is very pleased that lawmakers recognized that shifting a greater property tax burden on homeowners and businesses is bad public policy. This is a big win for municipalities and property taxpayers,” Gara added. However, those voting against the bill said they were concerned about a provision that accelerated a plan to reduce education cost sharing funds to wealthier districts. Under Gov. Dannel P. Malloy, an agreement had been reached to phase in a shift in education funding over a 10-year period from wealthier districts to struggling, poorer districts. Lamont’s proposal would phase out the funds to wealthier districts over a shorter period of time. Twenty Democrats voted in favor of House Bill 7150, while 15 Republicans and two House Democrats — Liz Linehan, D-Cheshire, and Jill Barry, D-Glastonbury — voted against it. Two legislators were absent.